If you've never had a Chicago style hot dog you are missing out, my friend. 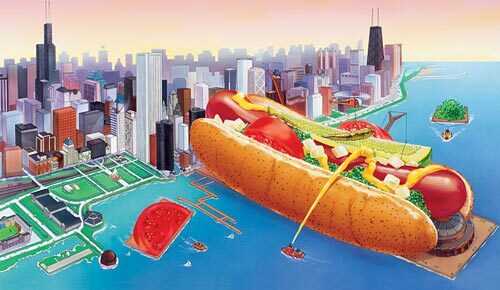 Chicago dogs are like regular hot dogs only in that they are an encased meat in a bun. The rest is a unique, down-to-earth quick meal that is all Chicago. You can get Chicago style dogs anywhere in the country, but the best place to get them is a neighborhood hot dog restaurant in Chicago, naturally. Another great place to eat a Chicago style hot dog is the bleachers at Wrigley Field. Comiskey Park is good too. Chicago dogs are easy to make at home as long as you have the right ingredients. What's on a Chicago Style Hot Dog? NO KETCHUP. 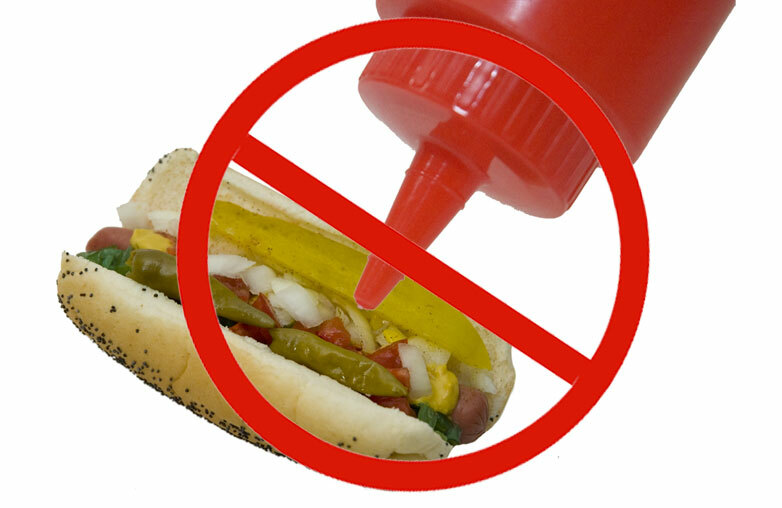 Chicago style hot dogs are traditionally served without ketchup. The sugar in ketchup throws off the balance, by overpowering the other flavors. If your age has more than one digit in it, don't get a hot dog with ketchup on it. At some places, like the Wiener's Circle on north Clark street, if you ask for ketchup, the cashier taking your order will verbally abuse you. That's kind of their thing over there. 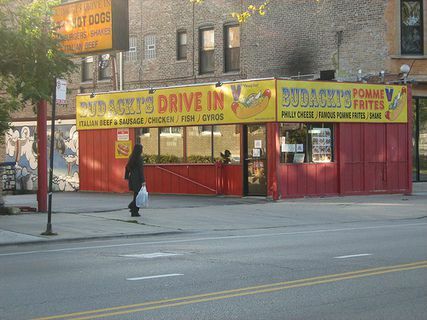 Budacki's is my newest local hot dog stand, and it's an excellent one. Located on Damen just south of Lawrence, it's probably most famous for this time in 2012 the late Anthony Bourdain (RIP) was going to shoot an episode of the show "Layover" there, the management put up fliers encouraging the locals to come out on shoot day. Tony got wind of this and was none too pleased, canceling the shoot. Still, the controversy made the local food blogs and pretty soon people from outside Ravenswood knew about the place. Win/win, in my book. Anyway the hot dogs here are excellent, the double cheeseburger is good, the breaded chicken sandwich also good. What makes Budacki's the kind of place Anthony Bourdain would shoot at is the delicious Korean BBQ inspired street eats, which complement the standard hot dog restaurant fare nicely. Cash only but they do have an ATM, and the first thing you see in the vestibule as you walk in is the classic Navy Pier poster heading this website. 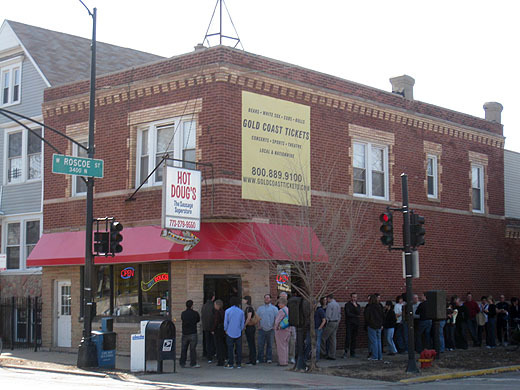 Founded by two Hot Doug's veterans, Hot 'G' Dog brings back many Hot Doug's favorites. Octavio and Juan Carlos Garcia serve duck fat fries, mighty hot andouille, foie gras, and duck sausage from this unassuming Uptown eatery. The meat's all here but the kitsch and attitude went with Doug to his Wrigley Field bleacher stand. 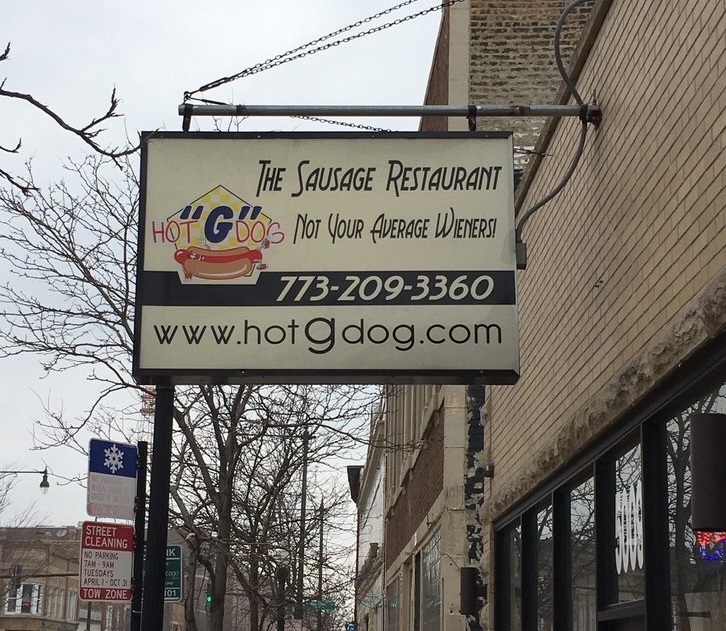 Since you don't have to pay $40 to get into Hot 'G' Dog before you even get a sausage that's a trade we'll take every day. 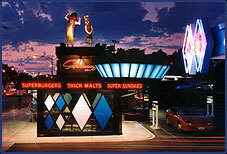 Superdawg is an old-school drive-in restaurant located at the corner of Milwaukee and Devon. They don't serve hot dogs but "Superdawgs" which are their own home-made all beef sausages, grilled (char-dogs) and served with a pickled green tomato. They come in a cool box that makes eating in your car a little less messy and a whole lot more stylish. Two large fiberglass mascots, Maurie and Flaurie, loom over the road from the roof. Last time I was there, Matrix directors Andy and Lana Wachowski were directing a scene of their upcoming globe-trotting Netflix series Sense8. If you're out in West Lafayette, Indiana, you might think there wouldn't be anywhere to get a Chicago dog. 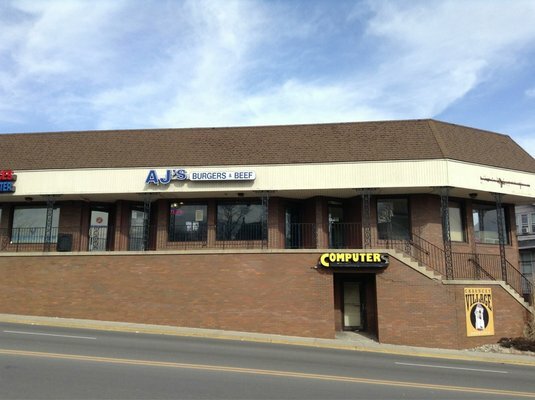 Well you would have been right until 2008, when some enterprising Chicago-area expats opened up AJ's Burgers and Beef, and opened the eyes of the Purdue student body to not only Chicago style hot dogs, but italian beefs and Maxwell St. Polish sausages. The real attraction, though not strictly a Chicago signature, is their garlic cheeseburger with waffle fries. To truly cement their status as the best burger in West Lafayette, no security guard ever pushed a pregnant girl through a plate glass window there. If I've missed your favorite hot dog spot (very likely), send me an E-mail, I'll try to pay a visit and add it to the collection. These restaurants are no longer operating. Thanks for the memories! For 13 years in Chicago's Avondale neighborhood, Hot Doug's stood as Chicago's most prominent hot dog restaurant, and for good reason. Doug himself manned the register, the fries are cooked in duck fat, and the line was famously long. Hot Doug's introduced Chicago's high-culinary scene to the humble dog with fresh ingredients and innovative, creative dishes that truly expanded the boundaries of what a hot dog could be. Doug Sohn retired from the hot dog biz on October 3, 2014, but Hot Doug's lives on in the memories of encased meats enthusiasts everywhere. UPDATE May 4, 2018 - Sometime after I moved out of Evanston in 2017, Wiener and Still Championed closed down. One day on the commute home I'll get a stopover at Davis and see what's going on over there. The restaurant will live on as the location of the classic meme image of Guy Fieri looking longingly into a window at a big plate of their excellent fries. 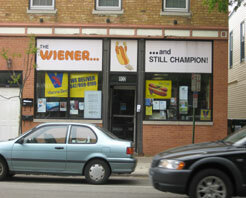 Located in the great north wilds of Evanston, Wiener and Still Champion is my neighborhood hot dog stand. Serving up delicious fries that rival Edzo's Burger Shop, the dogs here aren't bad either. Don't listen to the yelpers wearing dumb hats that like to grouse about this place's cleanliness and the owner Gus's surliness, otherwise you'll be missing out on one of Evanston's great lunch spots. See you there on Wiener Wednesday!